Thirteen members of the Irvington High School Science Research program presented their research projects at the Junior Science and Humanities Symposium, held at John Jay High School on February 9. The program provides students with an opportunity to pursue in-depth understanding of a topic of their choice in the sciences or engineering. 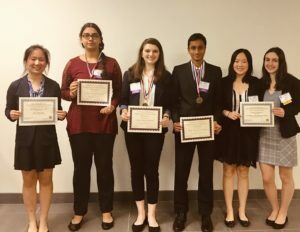 Those awarded were: Elizabeth Lee, first place in medicine and health; Julia Caldropoli and Chysmine Wong, third place in physical science; Aayushi Jha, fifth place in environmental science; Rishi Madabhushi, fifth place in computer science and math; Hannah Monack, third place in medical science. Monack was a poster presenter at the New York Upstate Junior Science and Humanities Symposium held March 27-28 at the University at Albany.